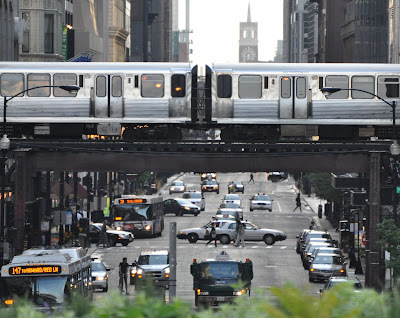 If you haven't visited Chicago in a few years, then the Loop lakefront area is going to surprise you. There's been a building boom as these two photos below show. The left picture is now. The right picture is "then" (around 1998). Yes, there was a golf course right in the Loop. It was constructed back in the 1990s as a way to use the land when a downtown office building glut postponed a big development. 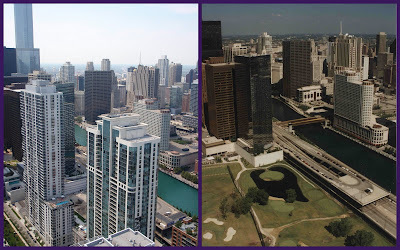 When the real estate market picked up again in the early 2000s, the golf course was closed and construction on the new Lakeshore East development began. When I was at the museum, the staircase looked like an eye, at the museum. This is the staircase at the Museum of Contemporary Art in Chicago. It spirals around a koi pond. Special Theme Day: Where is our Blogger? One of our fellow City Daily Photo bloggers is missing in Tehran. Today is a special Theme Day on City Daily Photo to show support for his freedom and everyone's continued freedom to share information and pictures. 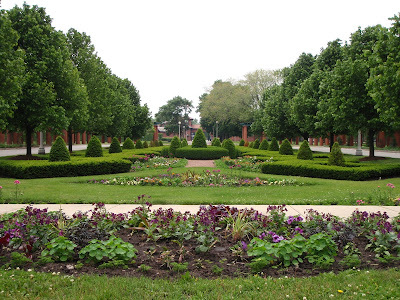 In 1998, Chicago renamed the road between the Shedd Aquarium and the Adler Planetarium, shown above, as Solidarity Drive to commemorate Lech Walesa's campaign, known as the Solidarity Movement, to bring freedom to Poland. Sometime in the last week, the farmers' markets burst into rainbows. This is just a small sample of my options at the markets. I love how the colors of produce change with the seasons. In early Spring, there's a lot of green (asparagus, leeks, spinach, lettuce, young garlic). Later in Spring, a little color starts creeping in with radishes, rhubarb and strawberries. Then Summer hits and the colors go wild. 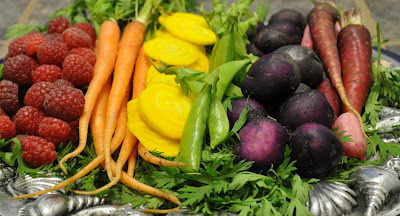 A lot of the farmers grow heirloom varieties so we get things like purple carrots, blue potatoes and yellow beets. We never would have been able to identify this little Red Eyed Vireo in Grant Park without this picture. We could see some identifying marks (eye stripes, coloring) in the other pictures I had, but there were a lot of birds that fit that general description. Its red eye is clear in this photo. 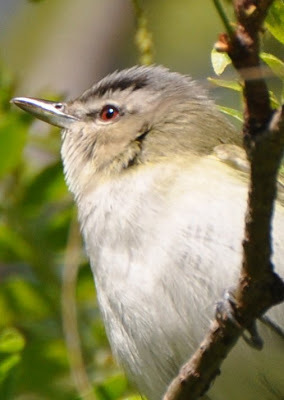 More pictures of the Red Eyed Vireo are at my birdwatching blog, which is here. This work crew was power-washing the building facade. I didn't see the the scaffolding at first; what caught my eye were the parked cars covered in plastic. That made me look up to see what was going on. I think you can better see the progress they've made in the second picture. 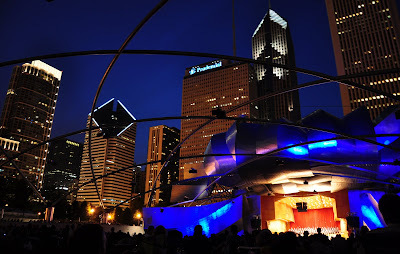 Free outdoor concerts are everywhere in Chicago in the Summer. They don't have them in the winter because it's hard to play the guitar when the strings are covered with ice. This is a band called Better Than Ezra. This was the first of three concerts in a series that will be held at Pioneer Court and is part of an effort to collect donations for the Greater Chicago Food Depository. Most Chicagoans - me included - put up with "The Winter" because of a day like Saturday. Warm. Light breeze. Clear blue sky. Outdoor music in the park. 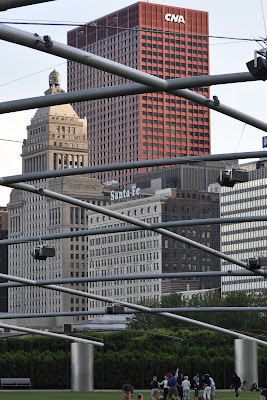 This is the Pritzker Pavilion in Millennium Park. The two views are Night and Day. I've shown the playground (the colorful little triangle in the middle of the photo) before - in January. It's prettier now that the grass is green and the trees have leaves. This is an expanded view that shows the playground is part of a fairly new park in Chicago. Lakeshore East Park opened in 2005 and is supposed to be the city's only Wi-Fi Park (I'd forgotten about that - have to check that out). The park is a pretty little green space in the middle of a canyon of tall buildings. 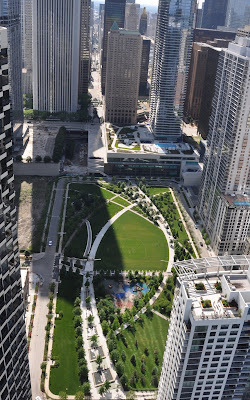 The crossing arc-shaped sidewalks in the park mimic the roof design of one of the first buildings that was built in the Lakeshore East development. 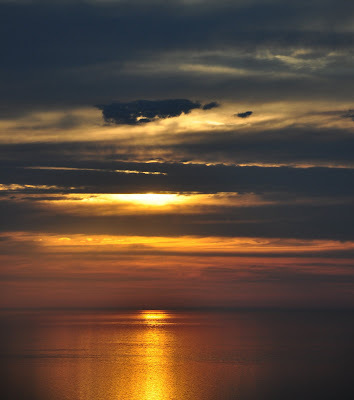 Since Summer arrived at 12:45 am CDT today (with the Summer Solstice), this is the first sunrise of Summer. It's got a lot more color and warmth to it than the photo I posted of the sunrise on the Winter Solstice. One of the Chicago River tour boats was passing under the Lake Shore Drive bridge just as I was walking over it. Couldn't resist taking a chance on a photo. I zoomed in a little too much - I thought the bridge was higher - and got quite the close-up. 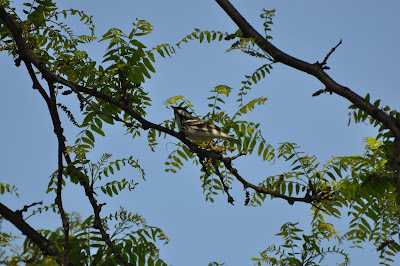 This little Black and White Warbler was in Grant Park. It was scampering up and down the tree trunk looking for dinner. It seemed like it was thinking "Uh-Oh! How did I get way up here? It's a long way down" when it looked down from this branch. At least that's what I'd be thinking. As usual on Feathered Friends Friday, there are a few more pictures of this Black and White Warbler at my birdwatching blog. 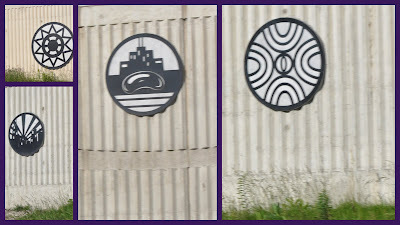 Along the Dan Ryan Expressway there are medallions with six different designs on them. I was able to get pictures of four of the designs as we rode by recently. Searching the internet, I finally hit on the right combination of search terms that led me to figure out what they were. The Dan Ryan Art Wall Project was part of the Dan Ryan Reconstruction work in 2006-2007. There are 146 of these medallions with six designs. Two of the designs below, the city scenes, were designed by Chicago Public Schools students with guidance from a Chicago artist (Bernard Williams who designed the other two medallions below) and the Little Black Pearl Art Center. I missed one of the CPS Design winners and the IDOT logo. Actually they've been at the farmers' markets for about two weeks now. But they are just getting sweeter as the season progresses. There are almost 100 common strawberry varieties and probably more hybrid varieties. Each have their own flavor, season, and shape. The farmers are all great about letting you know which ones are sweet and which ones are tart, all you have to do is ask. It's great to have fruit back at the markets. Soon we'll have blueberries, raspberries, and blackberries. Can't wait! 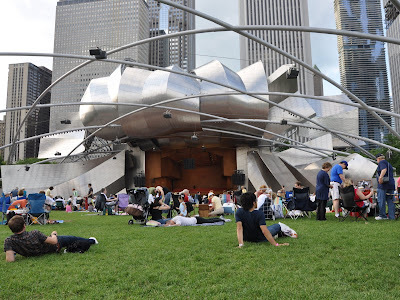 The Pritzker Pavilion in Millennium Park has free concerts all summer. There is a large criss-crossing structure that goes over the entire lawn area, constructed so that the sound system would cover the entire listening area. It's an amazing sound system. It's a great way to spend a summer evening -- enjoying a variety of music styles, with great company, and tasty snacks. Eggers Grove (also called Eggers Woods) is part of the Lake Calumet area -- a wooded, marshy, and prairie nature preserve in the middle of a highly industrialized area of Chicago. It's in the East Side neighborhood on the southeast side of Chicago -- over in the land of the alphabet streets: Avenue A, Avenue B, Avenue C, etc. (Street names start around the letter K). I'd never been there and was pleasantly shocked at what we found when exploring. Part of the Eggers Grove area is a lush green marshy jungle (see the second picture); the other part is an open prairie area. 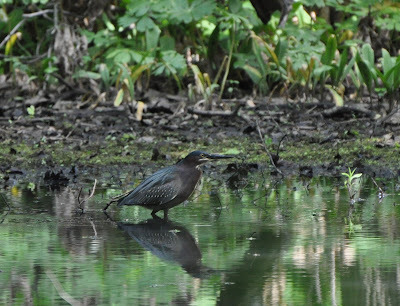 In the marshy section, we found this Green Heron hunting for its lunch. I have to admit, I do wonder about Green Herons. Here it is hunting in this cloudy water marsh. Previously we saw one by the North Branch of the Chicago River (also kind of a cloudy water area). These type of birds must have cast-iron digestive systems. I have a few more pictures of the Green Heron at Eggers Grove at my bird-watching site, which is here. Not all the methods of urban transportation, but many of them. Too bad one of those stretch Hummer limousines wasn't cruising down the street when I took this picture. This is the entrance to the South Shore Cultural Center. It's right at the southern end of the Lakefront Bike Path so it's a nice rest stop before heading back north on a bike trip. We were checking out the nature preserve at the South Shore Cultural Center on Sunday. 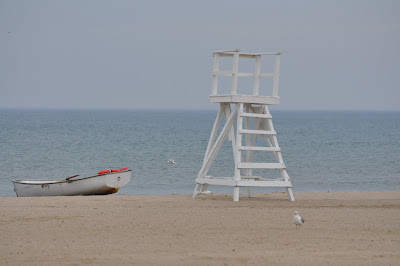 The lifeguard was walking the beach but his boat was ready just in case. It looks warm, right? Well, actually it was pretty warm in the South Shore neighborhood. Definitely T-Shirt and shorts weather. However, by the time we got into the downtown area - just about 10 miles away as the crow flies - it was in the 60s. Definitely sweater and jeans weather. Alright, the statue's name isn't really Bert. But when I zoomed in on the statue, one of the things that caught my eye was the staff in her left hand with the name/word "BERT" on it. Bert?!? Who the heck is Bert? I eventually figured out that the laurel leaf decorations on the staff must be hiding parts of the word "LIBERTY". Anyway. The real name for this Jackson Park statue is The Republic. 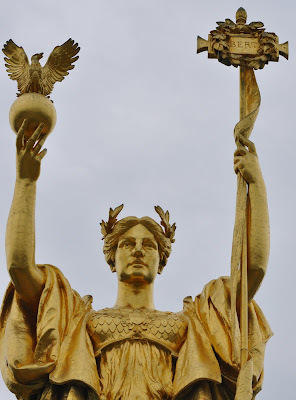 At 24 feet tall (plus another 10 feet for the base), it is a 1/3 scale model of a statue that stood in the area during the 1893 World's Columbian Exposition. According to the plaque, the gilded bronze sculpture was created by Daniel Chester French; the base is by Henry Bacon. It was originally dedicated in 1918 to mark the 25th anniversary of the Columbian Exposition. It's been restored, re-gilded, and re-dedicated to mark the 100th anniversary of the Exposition. 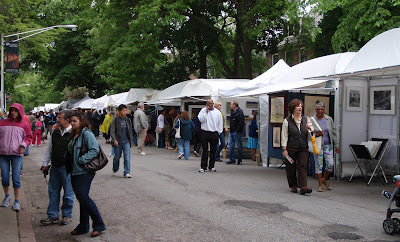 It may be chilly but it's June and that means Art Fair Season has officially begun in Chicago. 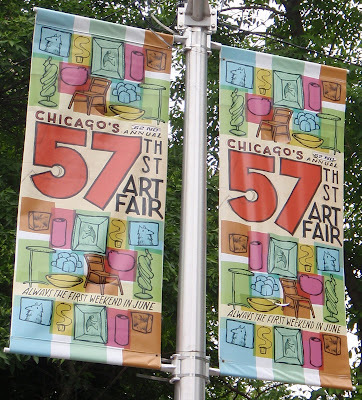 This is Hyde Park's 57th Street Art Fair, the oldest juried art fair in Chicago. From now to Labor Day, there will be at least one street closed somewhere in the city for an art fair, music fair, or neighborhood celebration. Yeah, I don't really know what was going on here. The two women did have leotards on under the sheet. And periodically the photographer would wave and sweep his arms around and then the women would sweep their arms out. 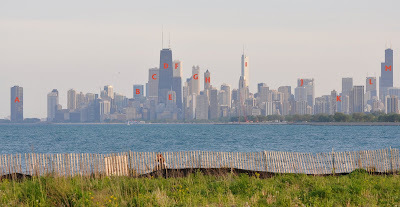 Maybe this happens a lot near Montrose Harbor. The woman walking her dog doesn't seem to notice anything unusual. But I'm going to use this one if the City Daily Photo Theme Day is ever "Sheets". 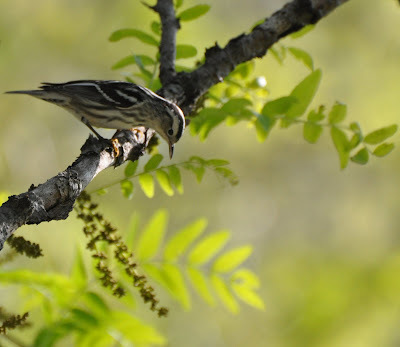 This is a blackpoll warbler that was passing through Grant Park. like this one, fading into the shadows. But, what most people don't know is that birds actually don't fly. ... LAUNCH themselves like little jet-propelled rocket ships. Through no photographic expertise - it's all just the luck of when the shutter opens - I've collected photos of several birds pretending they are little rockets. They are at my bird-watching site. Which is here. The line of yellow buses going east and the boats lined up pointing west caught my eye. Spent a few days in Peoria, Illinois recently. Here's a collage of photos. Two Takins at the Peoria Zoo, a bronze statue in the Luthy Botanical Gardens, an emu at the zoo, the king chess piece from a multi piece sculpture by Jaci Willis in the Botanical Gardens, a comical representation of asparagus by Peoria-area artist Don Kettleborough from his Incredible Edibles series, a Winter Wren in the Botanical Gardens, and a floral sculpture in the Gardens. A short trip to Peoria yielded this pretty sunset. I liked the puffs of clouds. It was taken through a screen so there is are faint cross-hatches in the photo. Happy Theme Day. June's theme, selected by vote of the City Daily Photo participants, is Feet. I found 12,652 feet in this picture. How? I picked several of the more recognizable buildings and looked up how tall they are. Here are the buildings I selected, their names and heights.